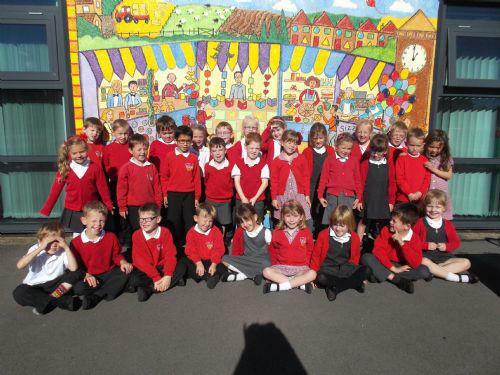 Year 1 visited Hall Hill Farm recently with Reception Class. They had some amazing experiences. They loved holding chicks, rabbits and guinea pigs . They were even allowed to feed the lambs with a bottle. Milking the model cows was fun and we fed other animals on the farm too, such as llamas, ponies and goats. The tractor ride was so exciting! Welcome back. I hope you all had a fantastic Easter break. This term we will be learning about Pirates and Princesses through stories and songs. In Science lessons we will learn about life cycles and plants. As it is the summer term, it will be great fun learning about the seaside. This will link with our science and in history lessons we will be looking at what the seaside was like in the past. (See the Summer Term Topic Overview at the bottom of this page). The Year 1 children performed 'Our First Spring' in celebration of Easter. Well done for an excellent performance! The children had a large amount of lines to learn and remembered these easily, speaking into the microphones slowly and clearly. Very impressive! Much fun was had by all at our Easter Assembly and after the show, the winning Easter egg competition winners were announced. Well done to everyone who entered. Happy New Year everyone and thank you so much for the wonderful cards and gifts received! The children will be learning about 'Space' this term and in science lessons, we will be looking at, naming and describing materials. We will be developing our acting skills to perform our 'Easter performance' and will enjoy creating and performing a dance for an audience. See the link below for our Spring Term overview. The KS1 Christmas Show 'Baubles' was amazing. All of the children should be happy with the outcome after putting in so much hard work. I am so proud that we have so many talented and confident children. The audience enjoyed the clever plot using Christmas tree baubles to tell the nativity story. Well done for an outstanding performance everyone! Welcome back everyone. I wish everyone a very happy and successful year at school. Please find information below that may be useful, including our topics for the Autumn Term. LOOK AT OUR VIDEO BELOW CELEBRATING SOME OF OUR RECENT WORK LINKED TO THE AUTUMN TERM TOPICS. THIS WILL BE ADDED TO WHEN WE HAVE FURTHER THINGS TO SHOW. The children combined a variety of gymnastics and dance moves to produce a routine for performance at a local leisure centre and at school. Music from The Lion King included 'The Stampede' and 'The Circle of Life'. All children with differing abilities, interests and levels of confidence contributed to the end result and were proud and excited to do so!!! WELL DONE YEAR 1 FOR AN EXCELLENT PERFORMANCE THAT CAPTIVATED US ALL! We learned about charities and raised money for Children in Need. We wore something spotty or a superhero costume! It was a brilliant, fun day starting with an assembly led by the SWAG (School Worldwide Awareness Group). They captured our interests with a quiz then provided each teacher with resources to use in our family groups. What a great day!!!! We enjoyed a surprise visit from Pudsey Bear. How exciting! We are learning about churches. On our visit to our local church we looked at the features of a church. We are going to explore what churches are used for. Why is there a goblet? Year 1 are learning gymnastics this term. They will use the skills learned in these lessons in a dance routine. Our routine will incorporate rolls, balances, mirroring and jumps. We will perform it for an audience at school and at a local leisure centre! WATCH THIS SPACE FOR PHOTOS IN OUR COSTUMES. 1. Stand up straight at the edge of your mat. 2. Put your hands flat on the mat. 5. Stand up straight then stretch tall to finish. Year 1 are learning to keep to the beat in music lessons this term. They are learning about different instruments and the sounds they make. Some of the instruments on the special mat. Playing instruments is such fun!!! Toys from the Past Visit this site to find out all about toys that children played with in Victorian Britain.